Each year the ACH Network—the payment network that universally connects all 12,000 financial institutions in the U.S.—transmits billions of transactions, mostly overnight from one financial institution to another to support direct deposit and direct payment via ACH. Yet in today’s environment, everyone wants everything faster—and that includes payments. This is why NACHA, the electronic payments association, together with the industry, is moving payments faster with same-day ACH. This initiative serves as an immediate action that the industry has taken to modernize the payments system and create a building block for a variety of products and services. It also provides an opportunity for every bank to review the services they offer to their customers. As of Sept. 23, 2016, Phase 1 of same-day ACH implementation will expand the traditional functionality of the network by supporting ACH credits moving more rapidly with three official settlement windows every 24 hours. It will provide an option for businesses, consumers and government entities that want to move money directly from their bank account more quickly and efficiently, supporting uses such as same-day bill or invoice payments; payroll products to better support hourly workers and other payroll needs; and B2B payments with potentially extensive remittance information. Two other mandatory phases of same-day ACH are also approved and scheduled. In Phase 2, which becomes effective Sept. 15, 2017, both credit and debit transactions will be supported. In Phase 3, by March 16, 2018, all receiving banks will be required to make available funds from same-day ACH credits no later than 5:00 p.m. local time. The ubiquitous nature of same-day ACH mandates that every receiving bank and credit union in the country support receipt of the three ACH settlement cycles. And that creates one of the values of same-day ACH for any consumer or business that wants to send its money the same day to someone else: There is no special enrollment nor squandered time figuring out if the other party participates. In September, they will be able to send an ACH credit to anyone in the country and have the surety of knowing that it will be received that same day. As such, same-day ACH opens the door for new business opportunities and customer solutions for financial institutions. In a 24/7, Internet-based environment, customers demand faster payments, and financial institutions are looking for innovative ways to meet those expectations. For originating banks, now is the time to decide which same-day ACH service will meet the needs of your various customers. Become familiar with the multitude of use cases. Same-day ACH is an option not only for your customers; you also have flexibility to determine which Standard Entry Class codes you may want to support. For receiving banks, to prepare for Sept. 23, you should understand the schedules for mandatory receipt of same-day transactions, as well as determine how and when to post received same-day transactions and make funds available. Banks must be up to speed on same-day ACH and ready for implementation because corporates also will be evaluating new opportunities to originate same-day payments and will want to discuss it as an option with their financial institutions. Part of your preparation should be to think about the services you can directly offer with same-day ACH to keep your customers closer to you by helping them with payment options you can now support. 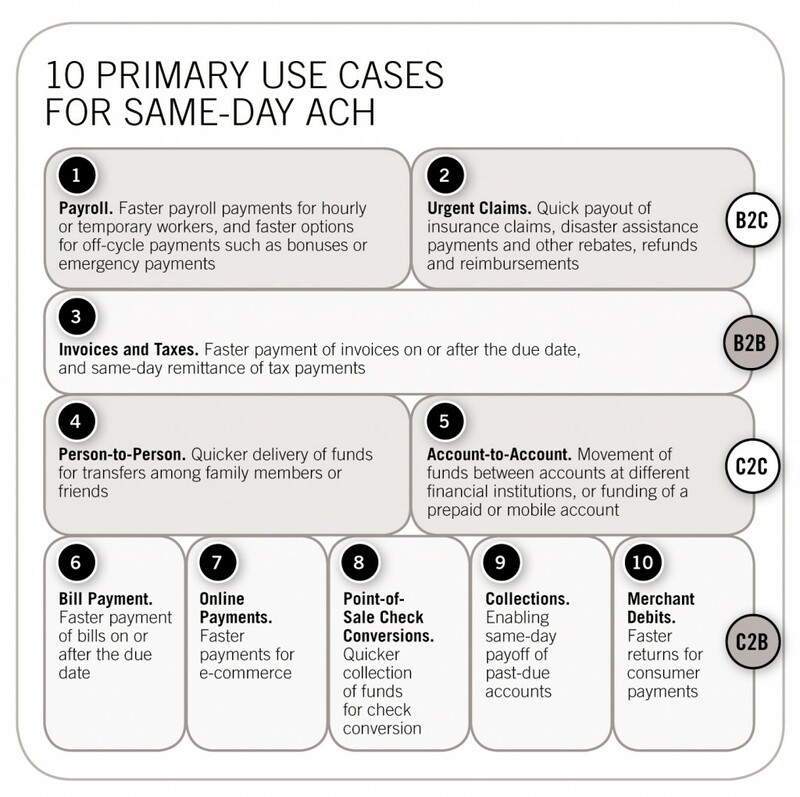 Research identified a total of 63 potential use cases for same-day ACH—with 10 primary ones. For example, users may want to leverage same-day ACH to take advantage of new, cost-effective options like urgent claims payments and refunds for the quick payout of items such as disaster assistance payments; person-to-person payments for quicker delivery of funds for transfers among family members and friends; and account-to-account payments for the movement of funds between accounts at different financial institutions. While same-day ACH offers new options and capabilities for corporates and financial institutions, it also provides opportunities for those looking to better manage credit risk or credit limits of their customers. Same-day ACH reduces outstanding credit between parties and exposure to losses by settling transactions more frequently during the day. A $25,000 limit per individual payment for same-day ACH transactions also helps to mitigate risk and loss. Faster velocity of payments means increased transaction scrutiny and monitoring, and a dollar limit helps to decrease the potential for loss. In addition, the dollar limit helps minimize the impact on daily business operations to simplify changes to end-of-day balance processes. Currently, more than 99 percent of ACH transactions are under $25,000, so the overall impact of the same-day limit is expected to be modest. Additionally, the exclusion of same day international ACH transactions (IATs) helps minimize operations impacts, as the receipt of an IAT triggers OFAC compliance requirements. Receiving IAT items late in the day could impose a significant burden on many financial institutions to complete the OFAC screening in a timely manner, so they remain next day ACH payments only. To put it simply, same-day ACH is a game changer for all network users. It provides value, opportunities and choices. Janet O. Estep is president and CEO of NACHA, which serves as trustee of the ACH Network, managing the development, administration and rules for the payment network that universally connects all 12,000 U.S. financial institutions.